100% Penguin, Panda & Hummingbird Safe, and Whitehat PR10, PR9, PR8, PR7, PR6, PR5 BACKLlNKS with BONUS Links! Backlinks will create on 200+ different high authority sites(PR10-PR5). That means your website will boost up on most trusted and best-ranked sites on Google. There are all Edu and Gov Sites, Multi-National Company Sites, Social Networking Sites, Web 2.0 sites & TOP Blog. Most links are do-follow and few links no-follow, contextual, anchored and non-anchored to stay more natural when the links are indexed. These links are 100% Google Panda & Penguin safe! Most backlinks are from high quality & authority sites with few outbound links, so old domain, contextual and relevant. 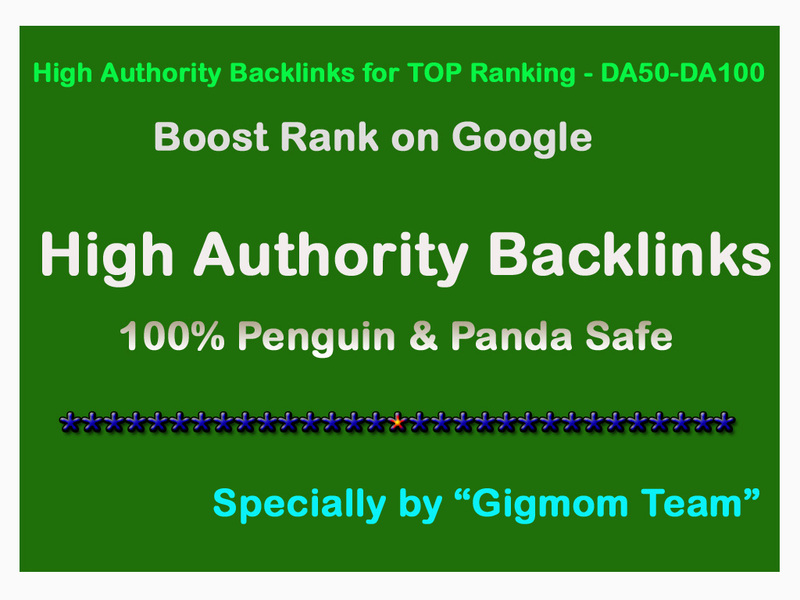 Create Manually 200 High Authority Backlinks for TOP Ranking - DA50-DA100 is ranked 5 out of 5. Based on 88 user reviews.